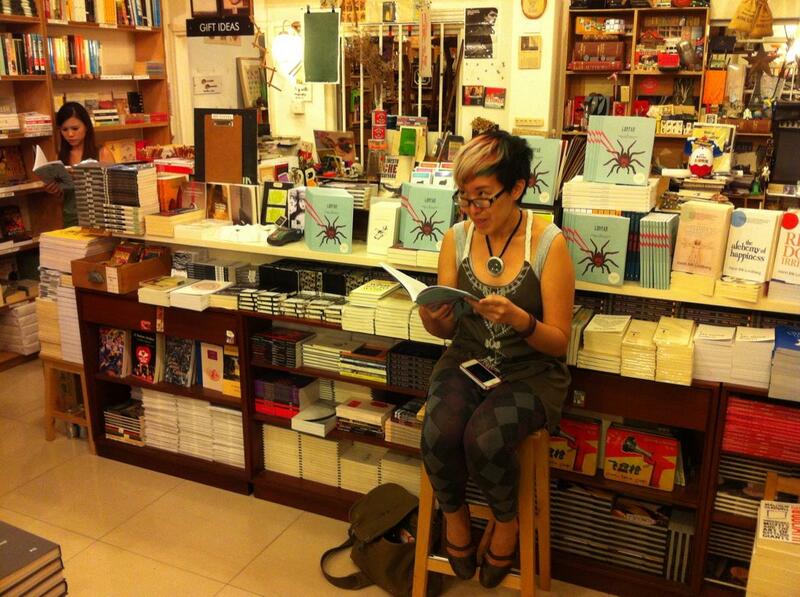 This past Thursday evening, LONTAR issue #1 was launched at BooksActually! Thanks go to everyone who attended and bought copies of the journal. And especial thanks go to all of our readers, who did a wonderful job bringing the pieces to life: Ang Si Min, Patricia Mulles, Alvin Pang, Wei Fen Lee, JY Yang, and Adan Jimenez. Below are some photos of the event (sorry I wasn’t able to get everyone!). Wei Fen Lee reading Elka Ray Nguyen’s story “The Yellow River”. Alvin Pang performing Chris Mooney-Singh’s poem “Jayawarman 9th Remembers the Dragon Archipelago”. Patricia Mulles reading Kate Osias’s story “Departures”. JY Yang reading Zen Cho’s story “Love in the Time of Utopia”. Photo by JY Yang. I honestly have no idea what face I’m making here, but June insists that it is “one of LITERARY DETERMINATION”. And I’ll take that.